Google + Ripples - yes they are this cool! So, what on Earth is this? This is probably one of the best tools Google+ offers, if you are trying to build your audience. How do I get to the Google+ Ripple? If you go to one of your posts or even someone else's post that has been +1'd several times and click the down arrow on the top right corner of the post, it will open a menu as seen below. When you click on View Ripples, you will see the Ripples graphic which shows you how many people have been active with the related post that you shared. 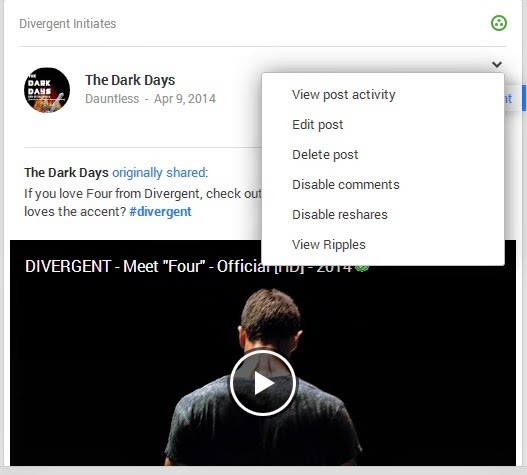 Now, if you post a video, as I did in the example above, the Google+ Ripple will show you people that have interacted with the post. You can now hover or click on each one of the circles and it will show you what that person posted and you can add them to your circles. For instance, this was a post about Divergent. I am trying to find readers for my prequel series to the Hunger Games. 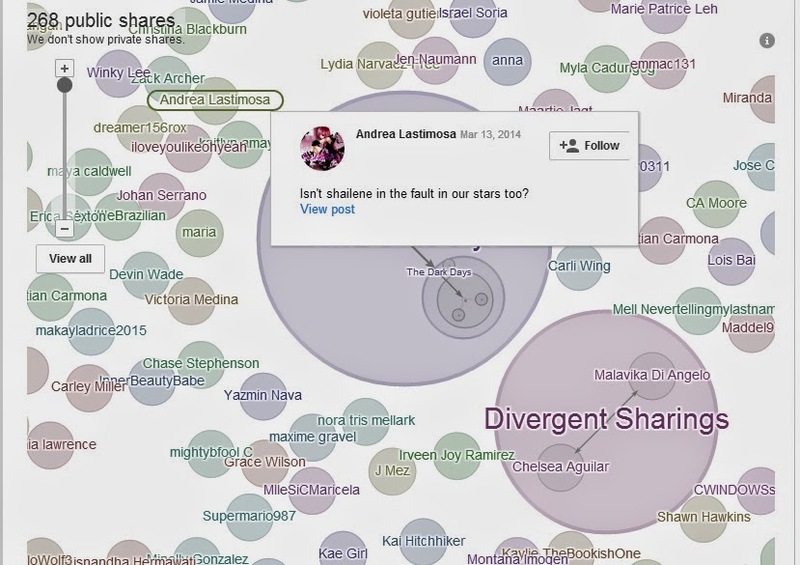 I know that every one of these circles represents someone who likes Divergent and is most likely a reader. (If they are a hater, I will be able to tell that by the post they made and steer clear). 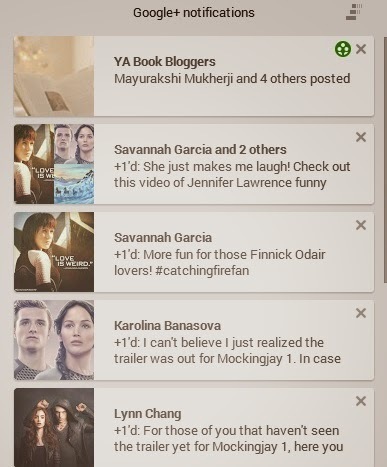 I also know that most of the people who like Divergent, also enjoyed The Hunger Games. When I add these people to my readers circle, they will be sent a notification that The Dark Days added them to their circle like this. Now, they will see my book cover because it is my avatar. Hopefully, it will perk their interest! 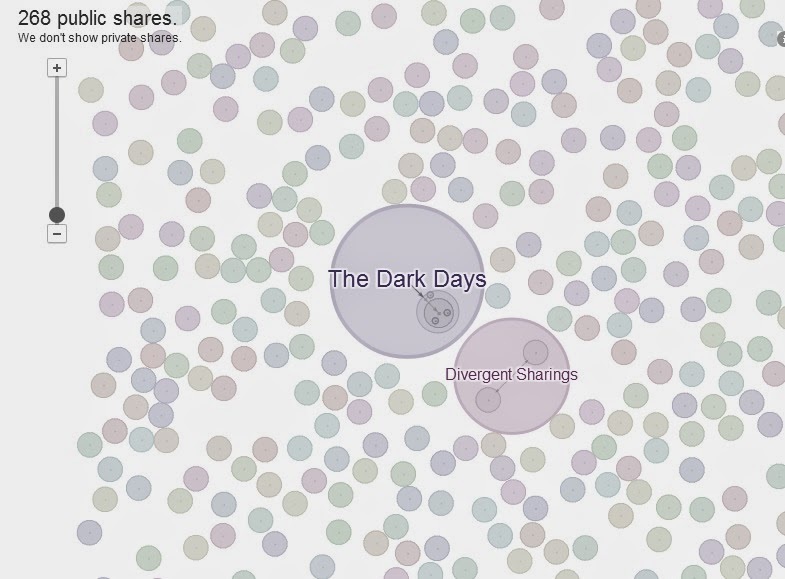 Out of 268 people from this Google+ Ripple, some of them will bite-and they did! So, that's easy you say because I have a tremendous head start with the relation to The Hunger Games and you're right, but here's how you can get Ripples going for your project. STEP 1: Think of something that is somehow related to your book, a main character, a place, etc. Let's say you have a romance novel and your main character loves to write or read poetry. STEP 2: Find various poetry related Google+ pages. Find posts that you enjoy and that are popular and have several +s. Comment on those, share them, +1 them, etc. Hang out, right? STEP 3: Now you should be able to view the Ripples on those posts from your Google+. STEP 4: Search through until you find a post with a good amount of Ripples. You can highlight every circle now and add them as Readers. You know they like poetry, so maybe they will like your book, too. All for now! Now get to it! p.s. If you enjoyed this post, please click the g+1 button below or share so that others may enjoy it, too!